One used page, front and back, from the hotel register of the Summit House of Athol, Massachusetts from 1874 and one page of accompanying ads. The ads were also used a a blotter and will have some small ink spots on it from being used, which ads to its charm. 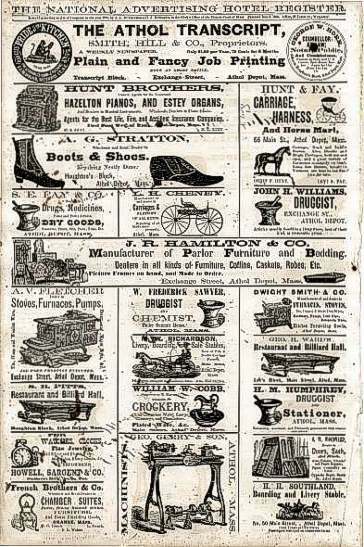 The ads were the same on the front and back and show wondeful companies and illustrations from carriages, boots and shoes, clocks, druggist, pianos. stoves and much more. 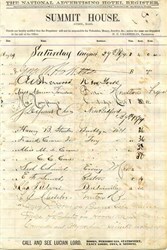 The guest page include the signatures of the guests, their residence, time checked in and room number. The hotel's proprietor was D. E. Chamberlin. This would look terrific framed. The size of the pages are 10 1/2" x 15 1/2".